For years, China has been the world’s plastic waste dump. Single use water bottles, yogurt cups, hummus containers, and countless other sundries we take for granted were shipped from developed countries to China for recycling. But a 2017 ban on the import of non-industrial waste is changing all that. Now, plastic once bound for Chinese recycling plants is being sent to landfills as the country cracks down on plastic waste streaming into its borders. This is becoming a huge issue. A new paper quantifies just how much plastic waste China has taken in over the past 28 years and how much excess plastic the rest of the world will be left to deal with if the ban stays in place. The answer isn’t pretty: 14.1 million metric tons of plastic were exported for recycling globally in 2016, according to the findings published on Wednesday in Science Advances. That represents an 817 percent increase in the amount of plastic exported in 1988, the first year of data. Nearly three-quarters of that plastic ended up being sent directly to China or through Hong Kong. 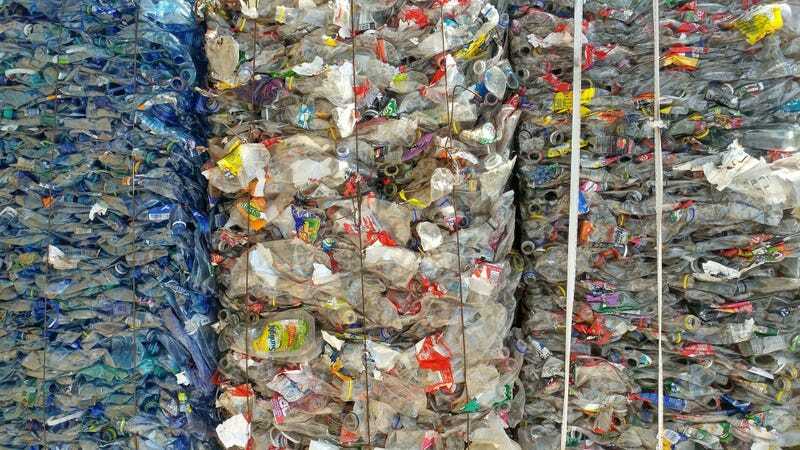 The vast majority of that plastic comes from developed countries, and the study expects plastic exports will continue to rise into the future. Without China to recycle it, 111 million cumulative metric tons of plastic waste—the equivalent of about 20.4 million African elephants—will be “displaced” by 2030. Displaced is a nice way of say we have no idea where it’s going to go. Other eastern Asian countries handle most of the plastic recycling that China doesn’t, but they’re nowhere near equipped to handle an influx of that size. And while some cities and states in developed countries are moving to curb the use of plastic bags and straws, those moves are a drop in the plastic supply bucket. Right now, more and more of that plastic is being diverted to landfills. And let’s not forget the plastic streaming into the Great Pacific Garbage Patch or even the hinterlands of the high Arctic. It’s even in our beer. All this illustrates the peril of relying on one market to handle recycling, as well as the hubris that the convenience of single-use items outweighs the consequences. The research suggests that countries could take more responsibility for recycling their own plastic or that countries doing the importing levy a tax to help improve their own waste management and infrastructure. The growing problem has been on others’ minds as well. Last year, researchers called for a global agreement governing how we deal with plastic, which they dubbed a “global threat.” The new findings show that threat is only likely to become more dire.